Magdeburger Joe.com: Israel Fire: Was It Arson? 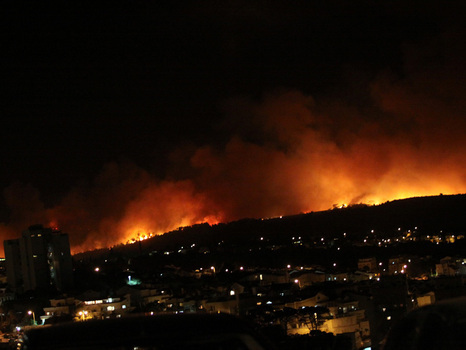 Israel is now battling the worst forest fire in its 62 year history as a modern state. There are already an estimated 40 people dead, a considerable number of them cadets from Israel's prison system. The Israeli government has already appealed for help from abroad in containing the raging blaze. In the appeal, foreign nations were asked to send planes that are able to dump chemicals on the fire. Arutz Sheva News has confirmed that Greece and Cyprus have sent firefighting helicopters to fight the blaze. There are unconfirmed reports that Egypt and Turkey have also rendered assistance in fighting the inferno. A prison as well as some towns and villages believed to be in danger from the fire are being instructed to evacuate the danger area. There have been conflicting reports about whether the fire has been contained. Suspicions of arson are being voiced with increasing frequency. The Virtual Jerusalem web site has reported that the fire started in three different places,making arson a plausible cause of the fires. If this proves to be the case, it would make the latest fire the worst act of terrorism in Israel's history as a state. If this latest fire proves to be arson, it would not be the first time that Israel has faced this threat in its history as a state. The Jewish National Fund has, on its web site openly discussed this possibility in the aftermath of past fires. Reforestation has been a critical part of Israel's development strategy during its modern history. If arson was involved in the latest fire, Israel needs to confront it openly and to inform its own people and the world. Ignoring this grim possibility will not make it go away or prevent further attempts in the future.